Adivasi Seva Samittee Nashik (Nashik Adivasi Seva), Nashik published a new job notification for Administrative Officers Posts. The recruitment is for total 03 Vacancies. The willing candidates are informed to see the latest notification March 2019. Qualification required M.B.A with 5 Years of Experience and More. Last Date of offline application is 13-03-2019. 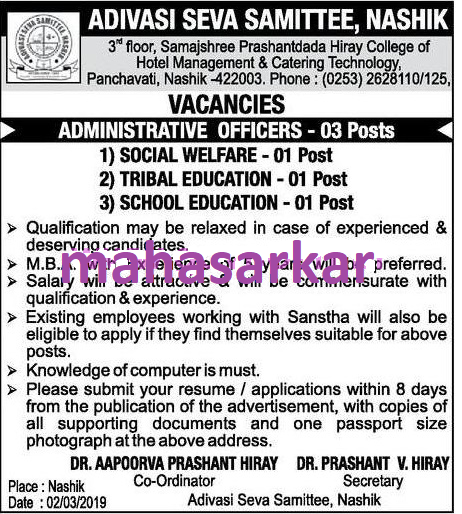 For More details of Adivasi Seva Samittee Nashik Recruitment 2019 Read Below. Education Qualification: M.B.A with 5 Years of Experience and More. For Post wise Education Details follow the detailed advertisement. Interested & Eligible candidates can send their application along with all the necessary documents and testimonials to 3rd Floor, Samajshree Prashantdada Hiray College of Hotel Management & Catering Technology Panchavati Nashik- 422003. Application starts offline 06-03-2019. Last Date of application is 13-03-2019.